Doing a bit o' research on classic illustrators can never lead you astray. 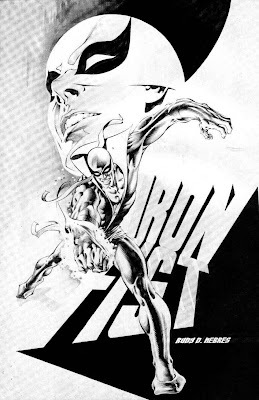 Case in point; while marvelling at the past works of Rudy D. Nebres, I came across this image of good ol' Iron Fist. An immortal weapon himself, Nebres captures the whole pulp era the character sprang from in art so sweet it could easilly be a movie poster. To join the Facebook appreciation group of Rudy's art, click the jump. Very nice. Has he ever done the Spectre? The Spectre would be an awesome choice Random! I'm not sure if he ever touched Jim's alter-ego (he did very little DC work that I know of), but he did a lot of work on the likes of Conan, Dr Strange and 'Deadly Hands of Kung-Fu. Still I've seen a lot of fan work of his for Captain Marvel - so hope for a Spectre piece still exists!